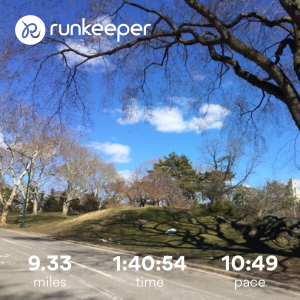 Although I’m not officially tapering as I’m just using Cherry Blossom as a long run for Brooklyn, I wanted to get “one last long run” in and I knew it had to be this weekend since I’m home next. Brooklyn training has been weird, to be honest. I’m frustrated with the Runkeeper app and can’t fudge Higdon enough to make it work for this schedule, so I’m kind of winging it. Not ideal, but I think it’s going to work. Funny, this time last year I was stressing about training for a 10K. So without an app/calendar alert to tell me what to run, I knew I could DIY. I was pretty well set on ~9 miles, but wasn’t sure on pushing through on that solo. My prior longest solo run was 7.77 miles (and I still have no idea how I stayed on the treadmill that long). Outdoors? I’m not sure. Probably about 10K. Maybe Rockland Lake since nothing else in my history jumps out at me. I was ready to try it, so off I went on a variation of the 15K course. It was a beautiful spring day. Slight chill but running in capris, a tee, long sleeve tee and light hat (oddly, same hat as I wore for the 15K) was perfect. That old age about mile one being a liar? 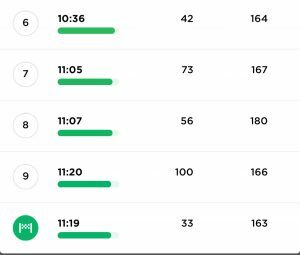 When I saw my watch at the end of mile one I was wondering what the hell happened to my GPS because the only time I’ve seen a sub 10 mile is sprints at Mile High Run Club. 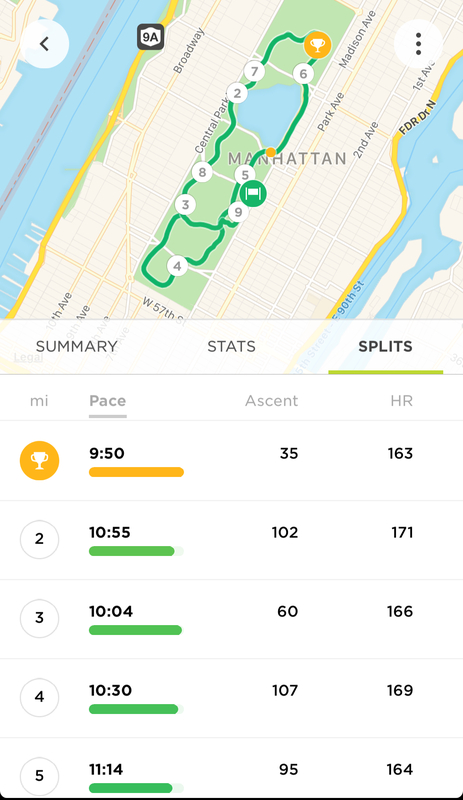 When it settled down to “normal” on mile two I figured it was just a blip, and then mile three happened. So I don’t know. 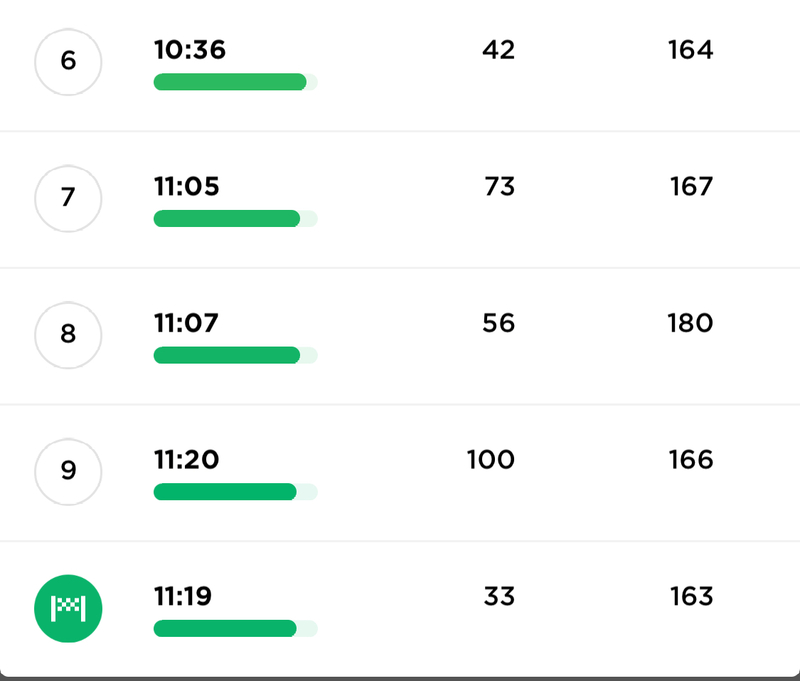 I didn’t feel like I was going that quickly even on a downhill mile. Will be interesting to watch the first mile next time. 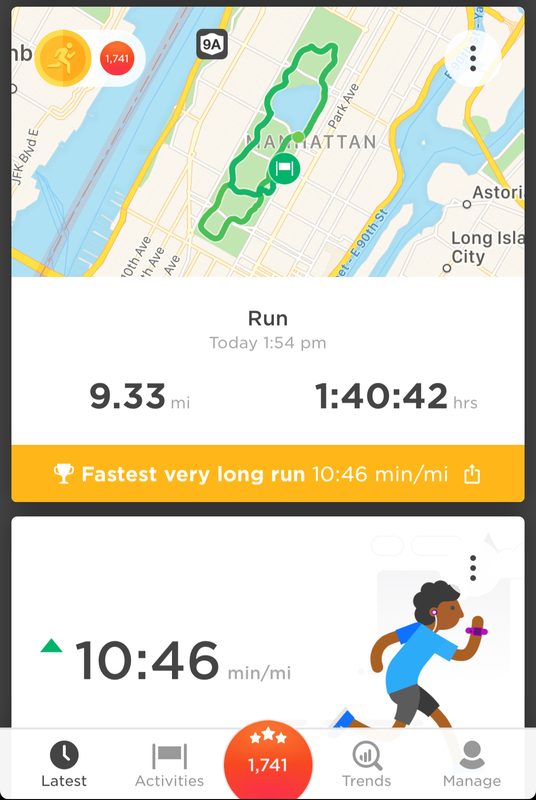 Luckily I start at this spot for most Central Park runs so that’s easy to track. There are way too many overlapping Strava segments to look at it that way. That looked way more normal, especially tiring legs. This is the longest I’ve run since the Fort Lauderdale Half. Over the first eight miles the only things I changed from the 15K course were: starting at E. 84th vs. 102nd, because why walk all the way up there when I could run it, and doing what I wish NYRR did, run the long loop down to the bottom of the park in the first lap, and then have the second lap cut back up at the 72nd Street Transverse. Mile 6.5-7.5 featured the West Side Rollers and they killed me. Partially a sore achilles but partially just tired. I knew then that there was no way in hell I was doing Cat Hill again so 8-9.33 was a wiggle fest to get in mileage by Conservatory Water. It’s crazy to see all the cherry blossoms in my Facebook memories this week, aside from a few patches of crocuses, Central Park is still hibernating due to a snowy March. What exactly is a “very long run”, TomTom? 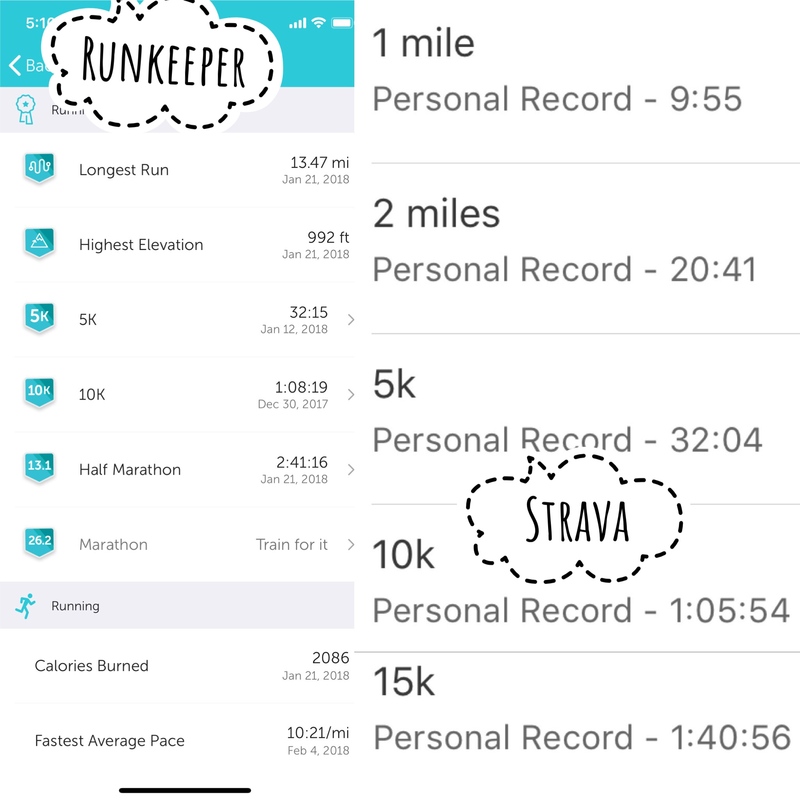 The difference between TomTom and RunKeeper is how RunKeeper (doesn’t) take into account the auto pause I switched on when someone stopped me for directions. Oh well, 1:40:42 or 1:40:54 isn’t the end of the world. What I realized when the man stopped me at a water fountain, I didn’t stop otherwise. There were no stretch breaks and I didn’t need to stop. That is definitely a first and part of what rendered this a nearly eight minute PR over December. Wow. 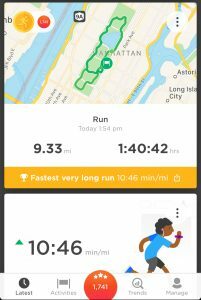 I know why Strava sees this as a 10K PR, the one RunKeeper “knows” was a combination of two treadmill stints. But the autopause discrepancy doesn’t account for why RunKeeper doesn’t see this too. Bizarrely when looking looking further at 10Ks it doesn’t see any of the longer distances. I wonder why it can’t when Strava can. The 5K I’ll write off as the autopause difference. All in all it felt very good. When I walked home after I was sore, but not horribly so. I had a good foam roll and will take Advil tonight. No running tomorrow. Music, and mentally writing this post got me through the last coupe miles. A gel, had I remembered to try it, might have done the job too. I think I’m ready for the Cherry Blossom 10. I’m definitely ready for spring. a reread of my Rockland Lake run is fun. Today’s run felt some of the same with feeling good, no need to stop. I’m hoping to do that run again next Saturday. V curious if the Poland Spring shirt now fits. I wonder what I can do at the 10K distance which I haven’t done on its own in a while. When left to my own devices, I tend to run 5 miles. I still think I can crack an hour – maybe by year end? Speaking of five miles, I put Wednesday’s snow day to good use and did 5.51 on the treadmill since I had way more time than I typically do on a weekday. Other than batshit boredom, it felt good. 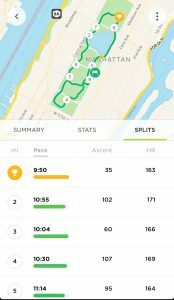 It was the first time I tried Gu Chews (3 at start, three at ~5K mark) and I liked them. Orange is a winning flavor. Coupled with Monday’s 3.19, this was a very good week. Friday was a 5K row as there was no money in the world that could get me on the treadmill. Massive case of “do not wanna”. It happens. 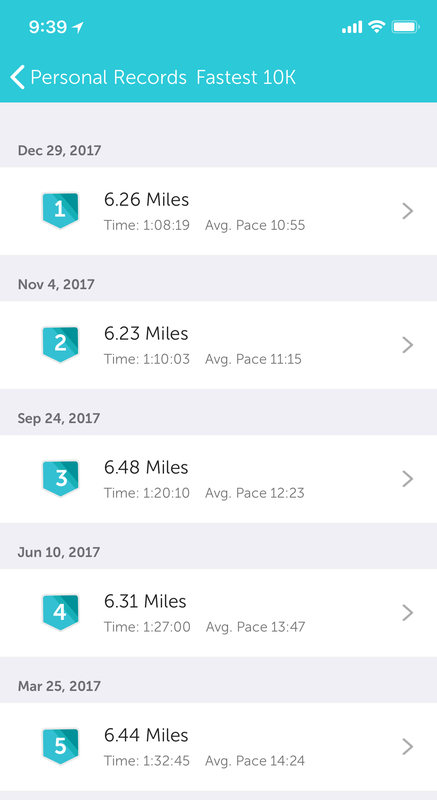 I finally adjusted my running mileage goal for the year. 780 was based on faulty math, mostly, and I pretty much knew it to be something that would need adjusting once the year started. Because I’d never run a Half, I didn’t know how much time I’d need to recover from those, and I didn’t plan to be injured. Again. Pushing for the numbers required to get 780 is not smart given the hip/knee/feet flares. 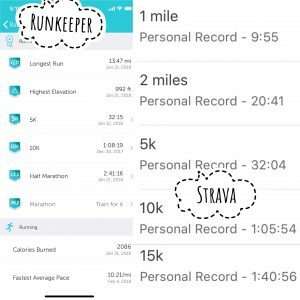 I’ve dropped it to 700 as one third ish of 2,018 and we’re a three person team for #RunTheYear. The spreadsheet also takes into account the rest days I take, and I need to average 2.68 miles per run day to hit the goal. I should be 539 miles from goal, and I’m 546. I can live with that. Much better than 602, 626. I’m very curious to see where I net out. 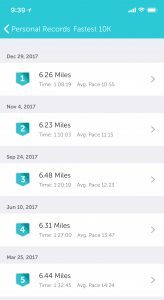 I’ve doubled my running year to date mileage and have 100+ run/walk mile head start, meaning I think those goals are real. It sounds like your running is going great! Congrats on a strong outdoor solo long run. I think you are definitely ready for Cherry Blossom! I’d love to run that one! Me too, hopefully. Weather is majorly iffy. I hope they don’t cancel.